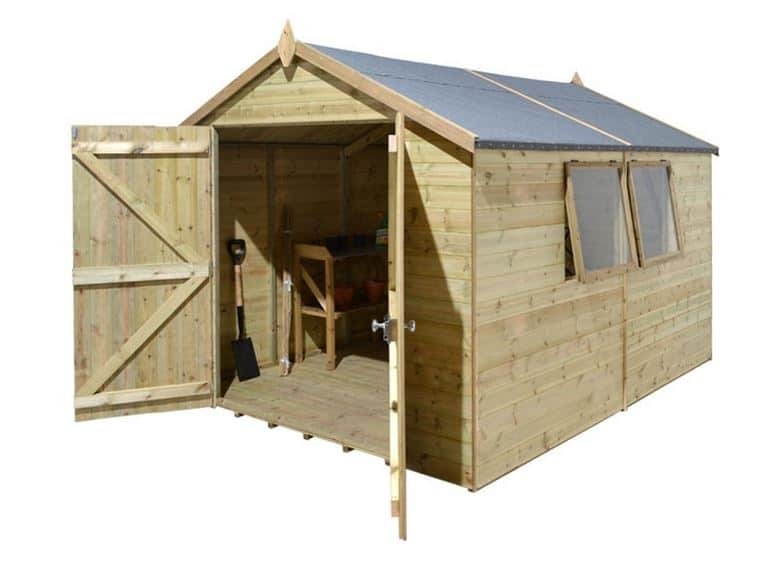 This heavy duty shed is strong and built to last, but what makes it particularly useful are the large double doors that open across the full frontage. 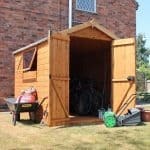 This makes it suitable for use as a mechanical workshop or a place to store and work on motorcycles, or alternatively as a large garden shed that can also be used to indulge a favourite hobby. With a shed of this price, quality is all important, so were delighted to see the thickness of tongue and groove cladding used as well as the cross framing. 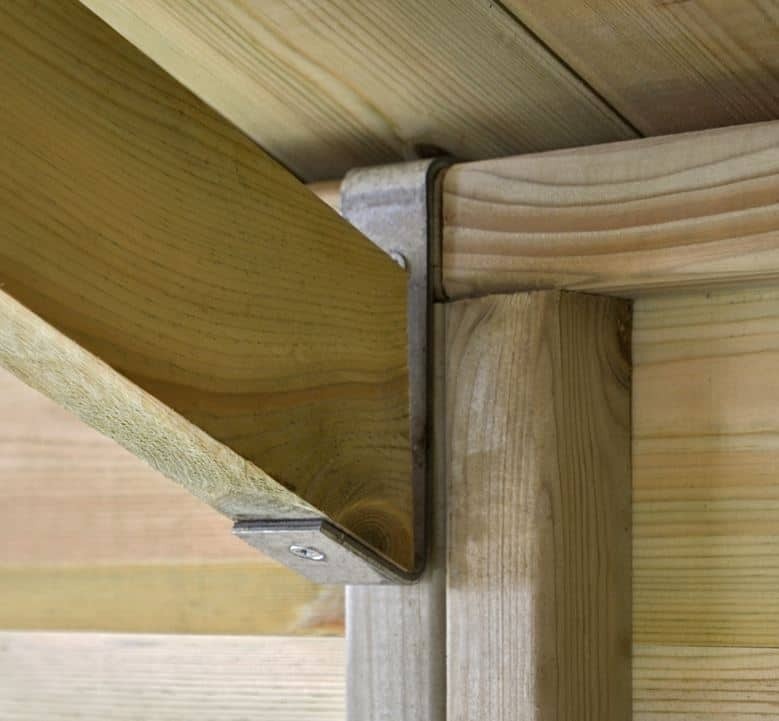 Every timber is perfectly engineered so you won’t have to worry about any gaps that could let rain through. This durability and weatherproofing is backed by a 15 year manufacturer’s warranty, which gives added peace of mind and ensures a rot free future for at least a decade and a half. Because this shed is so large, it could easily be used as a garden storage facility. If used for this purpose, security becomes even more important. That’s why it’s good to know that useful security features come as standard, even before alarms or CCTV cameras are added. The lock and key system is strong and resilient, and the windows are tough and shatter resistant. When reviewing a large shed, that could also serve as a workshop or storage facility, one of the first things we consider is how easy it is to move things in and out of it. 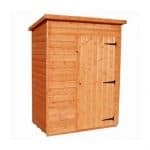 The double doors of this shed are the first feature that catches the eye, they form a very wide opening that would make this an ideal structure for transporting large or wide objects in or out of. 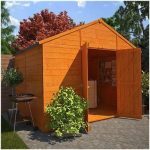 The apex design of this shed is also noticeable, because it is higher than many other wooden sheds and workshops that we review. This creates extra space when inside, and the slope of the apex also helps to keep the contents dry. At its peak height, the roof is 2.46m above the floor, and the eaves are 1.73m high, which you really notice when you’re walking around. The base of the shed is 3.05 metres wide, and 3.66 metres deep. The frame is important in any shed, especially in one of this size and frame. We were impressed with the strength of the 44 X 44m cross framing used, which is more substantial than the frames we often see on even larger workshops. 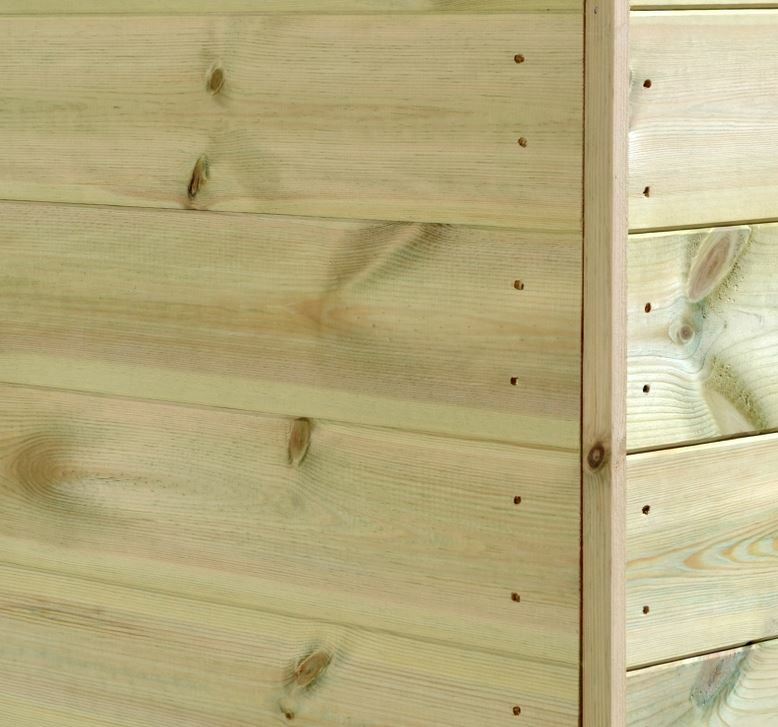 Tongue and groove cladding is used throughout the structure, and it has a more than adequate thickness of 12mm. This gives the building a sense of rigidity, even in windy conditions. Because the flooring is also made from interlocking tongue and groove boards it was firm underfoot and also keeps ground level moisture out. This problem is also combatted by the integrated pressure treated floor joists. These allow airflow to circulate underneath the floor, keeping condensation and rising moisture out. 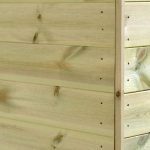 With a long warranty such as this one, with a rot free substrate guaranteed for 15 years, we often find that there is an onus on the shed owner to retreat the shed themselves every year or two year. This warranty, however, does not specify that any retreatment is required. We would, of course, recommend regular inspections to see if any further preservative is needed, but in itself this can lead to a significant saving of both time and money. The double doors are not only large and eye catching, they’re also triple hinged and fully braced. They were noticeably strong, and yet they opened easily giving an access width of 1.52m. They also have a height of 1.80m, so there’s no need to watch your head as you walk in, and you can also move tall equipment in without any problems. There are two windows on the centre of one side, and if required they can be kept open with a latch. We were pleased that safety glass was used for the glazing, as while not the cheapest option it has excellent shatter resistant qualities. Perhaps the most noticeable feature of these windows however was their size. We were impressed by how much they let natural light flood into the shed, and during daylight hours this would mean that you could comfortably work in there without the need for an artificial lighting source. The shatter resistance associated with the safety glass in itself acts as an extra security feature, but the major asset from a security point of view is the integrated lock and key system. 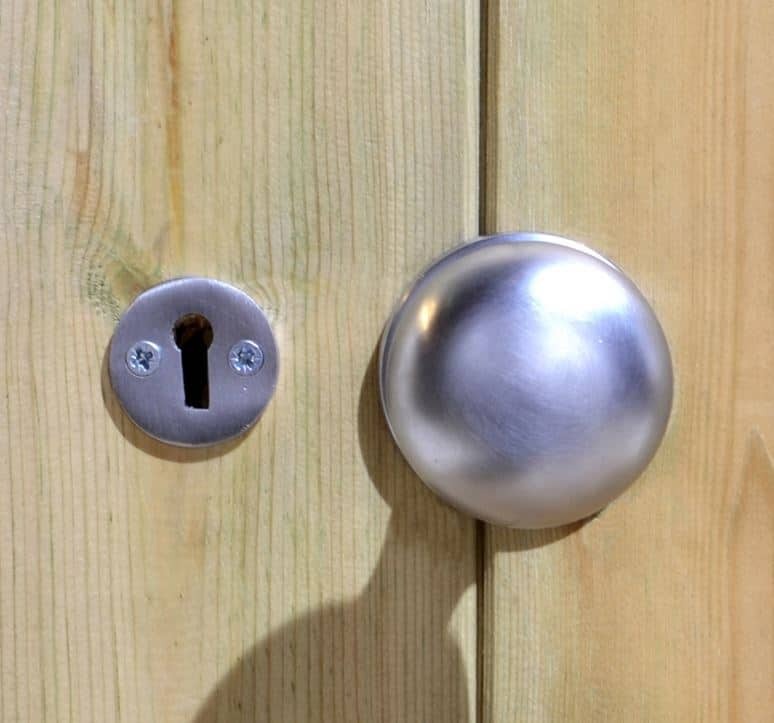 Without a key, unauthorised access becomes very difficult, especially when the weight and thickness of the door is considered. All but the most determined thieves would be deterred simply by the sight of this locking system. 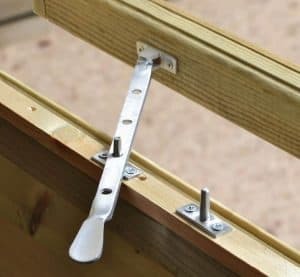 When installing the shed we were pleased to see that the instructions were straight forward and easy to follow, yet it would still prove difficult to self-assemble for most people. That’s why the manufacturers offer a professional installation service that they say allows the shed to be installed in just one day. 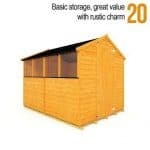 A customised workbench and a 16’ X 10’ slatted roof are also available to purchase with this shed. They both combine a rustic attractiveness with functionality, offering a space saving place to work and excellent rain resistance respectively. 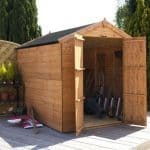 We would also recommend that a durable stain or paint that is suitable for use on smooth planed wood is also used on this shed, as this not only allows the owner to personalise it in a shade of their choice, it also means that there is extra protection against the fading effects of the sun. The robust frame and thick tongue and groove cladding used across the entirety of the shed are symptomatic of the superior quality evident in this shed. 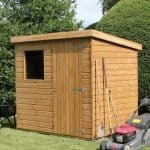 Fifteen years is a good and reassuring warranty to get with any wooden shed, and yet the materials used in this shed are so durable that we wouldn’t be surprised to see it last much longer than that. The large dimensions of this shed can be used to maximum effect, thanks to the wide double doors that make it simplicity itself to transport objects in and out. The tall apex roof also adds extra capacity. We managed to install this shed with two people, but with so much material, and tongue and groove cladding, this could be a struggle for most people. An optional installation service can be used to overcome this factor. 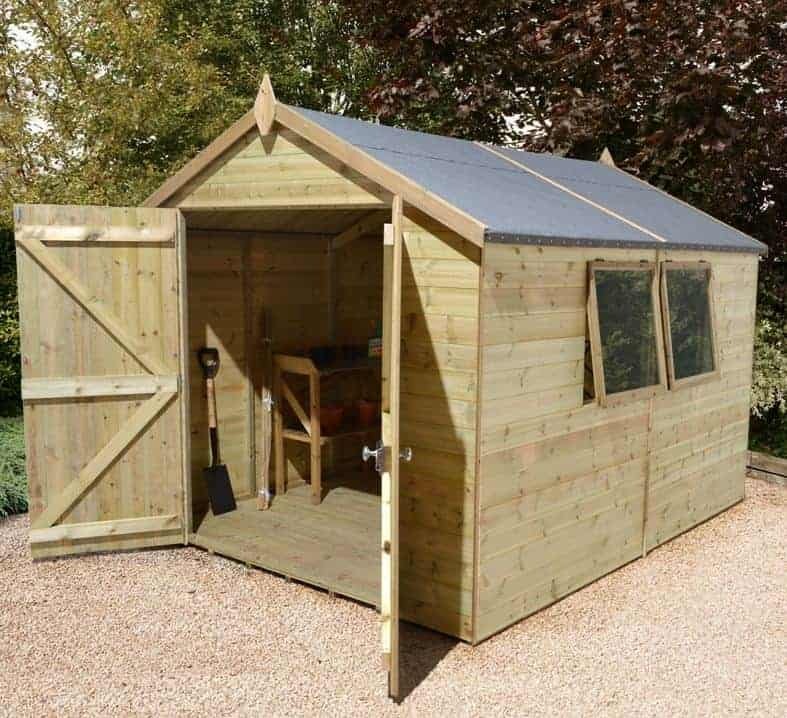 Although some people will find the price of this shed out of their reach, we still feel it offers reasonable value for money thanks to its large capacity and long lasting protection confirmed by the 15 year warranty. Final Thoughts: Considering its bulk we still found this to be a good looking shed, and it deserves to be considered by people looking for a high quality wooden workshop. The double doors are functional but look attractive as well, as does the smooth tongue and groove cladding around the exterior. This can be enhanced further if a wood stain is used, although this isn’t offered as standard. Owners of this shed will find reassurance from the manufacturer’s warranty and the excellent weather protection offered by the apex roof down to the pressure treated floor joists, as well as from the secure lock and key system that keeps the doors firmly shut.